And to take your hand, along the sand. 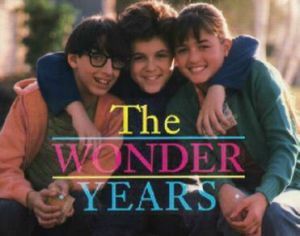 Probably no episode of any tv show pounded more at my prepubescent heartstrings than the one below from the 80’s big tv hit –The Wonder Years. I am too young to remember the time frame the show is about really…but it feels perfect. I’ve talked to people who said it is really a fair representation of the time. I remember the show in the 80s and loved it. A very happy mistake to lead you toward Dylan. I really like the scene in Don’t Look Back…he treats Donovan well. He does treat him well. There’s enormous respect between them. Also, Donovan’s song and performance is fantastic. That would be quite the undertaking watching all those WY episodes again! Lol I really liked that show! I’m glad you brought it up. WKRP took forever to be released because of the music rights. Oh a great tv show in the late seventies and eighties about a rock radio station. Good music and funny show. It was called WKRP in Cincinnati…. They do have the Wonder Years on dvd! Ah ok sweet. By the way just watching the end of Tarkovsky’s ‘Solaris’ . I couldn’t make it the whole way through last night. Not a fault of the film however. Nice, I’m really looking forward to your opinion on it. When we have that sensitivity to the surface and the romantic overflows the heart, there are scenes that fills us with joy and makes us live again what the youth set us. A good series and I did not miss it either. Great comment! Thank you very much. Such a beautifully written Poem. I am not familiar with the show, but will look it up on Netflix. Thank you for your message. I haven’t seen the show since my teens, but I imagine it still holds up well. Loved that show- and I was that age of Kevin as far as the time when the show was -late 60’s- I think they got about everything right. Now I want to watch the series again. That’s what I hear is that they nailed the era it was set. To read you feel the same having been his age at the time it was based, gives it even more credential. It must have been an amazing era to have grown up in. Cheer Hans.